Light intensity can be measured in three ways: luminous intensity, luminous flux and luminous power. Led Lights are here analyzed. 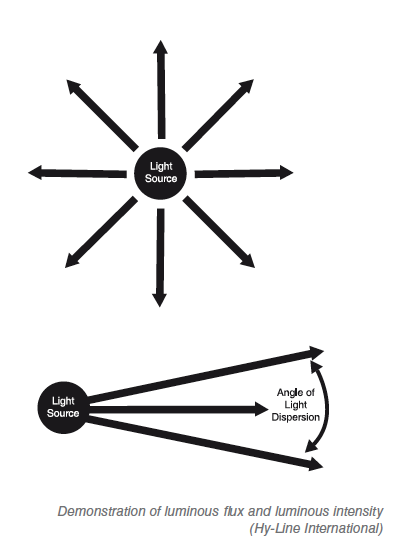 Luminous flux is the total emitted visible light from a bulb, measured in lumens. Luminous intensity (directional flux) quantifies the luminous flux emitted by a light source in a certain direction, measured in candelas or candles. 1 fc = 10.76 lux or 1 lux = 0.0929 fc; this is equal to the conversion between 1 square meter (mq) and 1 square foot (ftq) (i.e. 1 mq = 10.76 ftq). This means that the same light will be brighter closer to the light source, and dimmer farther away as the beam spreads out. Traditional light meters are calibrated for the human spectral response at a white color temperature with a spectrum between 550–560 nm. These light meters are unable to assess blue or red spectrum and cannot calculate the difference in light response between humans and poultry. It is important to be able to observe light intensity in both the visible blue and visible red spectra due to the chicken’s wider visible light spectrum. Ideal light meters for assessing LED bulbs are either poultry-specific light meters or LED-specific light meters. Poultry-specific light meters are able to calculate the effective light intensity as observed by a chicken (clux), while LED-specific light meters are able to analyze the full spectral output of the light for human vision. Only a few companies make poultry-specific light meters, while LED light meters are used by photographers and are available from several sources. With incandescent lights, the luminal output in relation to the wattage of the bulb is consistent across manufacturers. Most traditional incandescent bulbs are sold in 40, 60, 75 and 100-watt versions. With the introduction of compact fluorescent lights and now LED bulbs, most light manufacturers still relate the luminous flux of the bulb back to an incandescent wattage equivalent. The equivalence between CFL bulbs and incandescent bulbs is valid because both types of bulbs emit light evenly. However, LED light is more directional, and using lumens may not be accurate. Wattage and other factors, such as desired light direction, light color spectrum and intended light usage, should be considered. Luminous flux assesses the total light output of a bulb without any regard to direction; however, many LED lights can emit light with an angle of dispersion of 30° to 180° or greater, based on heat sink fins, diode direction and general construction. Two identical lights—one directional (i.e. LED) and the other with global output (i.e. CFL)—can have the same luminous flux, but depending on the location in relation to the bulb, will have very different candle and illuminance power. 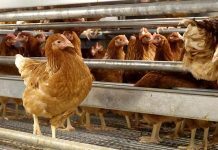 LED lights are becoming more common for use with poultry around the world because they are energy-efficient, full-spectrum and long-lasting. 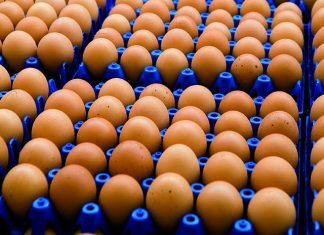 The light emitted from an LED bulb is inherently directional, and may create shadows when there is poor lens diffusion or placement in the poultry house. While achieving a light angle output of less than 180° can be beneficial in directing light toward the birds, the spacing of the lights must be appropriate to avoid shadows. Lights hung too low or with a beam angle of less than 120° produce the effect of “spotlighting,” where cones of light and dark areas are created in the house. While these lights can be utilized effectively, spotlighting can be minimized by careful placement and spacing of the lights. 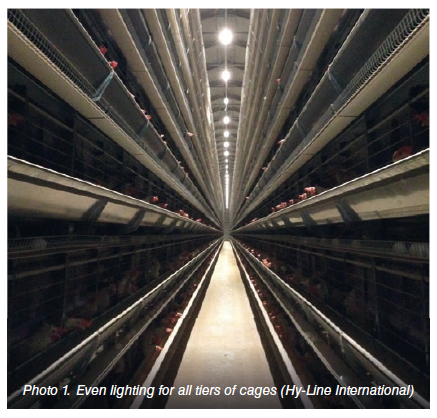 Uneven light distribution is an issue in both floor and cage housing systems. In floor houses, uneven lighting causes shadows, creating nesting areas for birds and resulting in higher levels of floor eggs. In cage or colony houses, uneven light distribution may cause some cages to have too much or too little light, leading to both over and under stimulation in the same house. LED lights do not emit as much heat as incandescent or fluorescent lights; therefore, plastic or polycarbonate materials can be utilized for the lens and diffuser. While the newer generation LED lights have better light diffusion, it is still important to understand the directional light output of LED bulbs when planning your lighting system, taking into account the placement, light intensity and intended usage. Most LED manufacturers have computer programs to assess the distance, height and lumen output required to adequately light any facility. In colony cages, select a directional light that illuminates the scratch pad and feed/water lines, while leaving the nest in shadow. 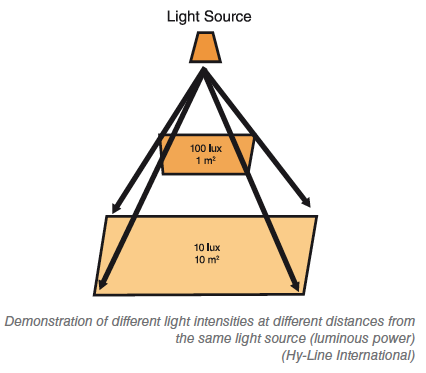 When LED lights are hung in the aisle outside cages, an appropriate directional light will provide uniform light intensity to all tiers of cages, as shown in the Figure. The lumen output of a light does not account for the peak wavelength spectrum. For example, two LED lights that are both listed at 800 lumens may elicit different responses from chickens if the color spectra of the lights are different. While using chromaticity (K) can help separate different lights with similar luminosity, this measurement does not accurately account for the full spectral quality of the light. LED lights may require different electrical wiring in a house. Some states and countries ban the use of screw-type sockets that are not water-tight and instead require that lights be wired directly into junction boxes. Check local regulations before installing or retrofitting a house for LED lights. Dimmers need to be compatible with the specific LED lights installed and used with an LED bulb that is rated for dimming. Incompatible dimmers may cause LED lights to flicker, overheat or burn out more quickly. LED lights do not have a resistive filament like an incandescent bulb, and require dimmers to be able to handle the complex electrical load to control wattage output. Not all LED lights are designed to be dimmable, and not all dimmable LED lights will work exactly as intended. A good dimmable LED light requires the right equipment to dim even with a proper LED dimmer. A good LED dimmer will have resistance built into the dimmer to ensure consistent performance when dimmed. LED lights maintain efficiency when dimmed, and may increase the bulb life. Work with the LED manufacturer to ensure you have the correct dimmer installed. Incandescent and LED dimmers both operate similarly; however, LED dimmers must have greater control of wattage output. If a dimmer turned to 50% is fluctuating + / – 3 watts, a 60-watt incandescent bulb will jump in power usage from 27 to 33 watts, which may not be perceptible to the human eye. The same dimmer fluctuating for a 10-watt LED bulb will cause the difference in power usage to jump between 2 and 8 watts. This extreme change in power going into the light will cause noticeable flickering. Additionally, even small fluctuations in power will cause dimmed LED lights to flicker. Selecting the right LED light bulb can be difficult once the decision to retrofit or build has been made. 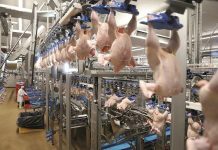 Poultry-specific LED lights — Although the most expensive, poultry-specific LED lights are engineered for poultry vision, and their manufacturers understand the needs of the poultry industry. These lights are typically rated to withstand cleaning and disinfection procedures in a chicken house. General LED lights rated for agricultural use — General agriculture-grade LED lights usually withstand the environmental conditions of a poultry house. While these lights are less expensive, understanding their full details (including light output, spectrum, warranty and level of waterproofness) is important before installation. Standard household LED lights — Standard household LED lights have also been used in poultry houses with many of the same issues as the agricultural LED lights. These lights are typically not rated for use at 16 hours per day, leading to higher levels of premature dimming or burn out due to inadequate heat sinks or circuitry. Overall, different types of LED bulbs have different ideal uses. Very directional lights (30–50°) placed closely together on 6–8-foot centers (1.8–2.4 m) can provide even lighting in tall caged houses. Very broad lights (>180°) are more effective for floor and aviary houses. Lights with medium directionality (90–150°) can be used in a variety of environments, depending on the spacing and the luminous flux. 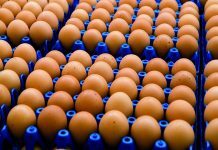 Light duration, spectrum and intensity are critical for optimum peaks and sustained egg production. 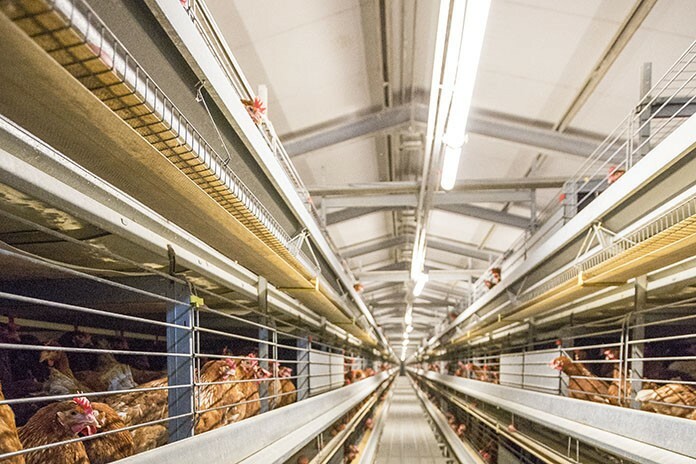 While there are many choices in lighting available to the poultry producer, LED lights are becoming increasingly popular due to the combination of energy efficiency, reliability and long bulb life. As the use of LED lights increases, the understanding of proper application in various housing types will increase. Lower product costs and improved efficiency and application of LED lights can be expected in the future. This technical bulletin is only intended to educate producers on various lights and lighting resources. Any changes to electrical systems on a farm should meet local regulations.